A beautiful smile says a lot about the person wearing it. 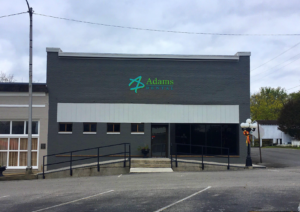 If you have major or minor imperfections that you’d like to correct, Adams Dental can offer a variety of services to help improve the appearance of your smile. Teeth start out white at an early age and gradually turn yellow or gray throughout life. Genetics play a role in the color of teeth, along with diet and lifestyle choices. Common causes of stains include coffee, tea and soda, as well as dark-colored foods like blueberries. Sometimes, discoloration is due to childhood medications or illness. The quickest way to enhance the appearance of your smile and remove stains caused by food, beverages, or medications is professional whitening. We offer in-office options that can whiten teeth up to 8 shades in 30 minutes. We also offer in-home options that whiten in either a three-day or two-week time frame, depending on the product selected. Getting a beautiful, white smile is less costly than you may think. We have a product to suit every budget. Learn more about our teeth whitening options. Cosmetic bonding can correct chipped, broken, misshapen, discolored, or gapped teeth. Your dentist can apply a dental composite material that looks like enamel onto the surface of a tooth and sculpt it into shape before hardening it with a high-intensity light to bond it to your natural tooth. The result is a restoration that blends invisibly with the surrounding tooth structure to create a more consistent smile. A filling is used to repair a tooth that is affected by decay, cracks or fractures. The decayed or affected portion of the tooth will be removed and then filled with a composite filling. Many types of filling materials are available, each with their own advantages and disadvantages. Composite fillings, along with silver amalgam fillings, are the most widely used today. Because composite fillings are tooth colored, they can be closely matched to the color of existing teeth and are more aesthetically suited for use in the more visible areas of the mouth. As with most dental restorations, composite fillings are not permanent and may have to be replaced. They are very durable, however, and will last many years, giving you a long-lasting smile. When tooth decay has led to the development of a cavity, or a small hole, in the tooth, we will remove all areas of decay and replace them with a filling made of composite resin. Composite resin fillings have surged in popularity because their appearance perfectly matches the natural appearance of teeth. In cases of more extensive decay, porcelain or zirconia crowns are an advisable alternative. The dentist will remove the decay and take an impression of the area to be restored. The laboratory works from this impression to create a restorative inlay or onlay, usually out of porcelain, that fits perfectly on the tooth. Inlays cover one or more tooth surfaces, where onlays are used on the chewing surface of the tooth. The inlay or onlay is cemented securely into place, for an incredibly durable, stable tooth restoration. If you have a tooth that is chipped, cracked, badly decayed, or otherwise weakened, our dentist may suggest a crown for your treatment. Crowns maintain the esthetic appearance of teeth by covering the entire visible surface of the tooth, while adding significant reinforcement and protection to the tooth. After removing all areas of decay, we will take an impression of the tooth to be crowned and send it to the dental laboratory to create the crown. Porcelain crowns are extremely natural looking and virtually indistinguishable from other teeth, making them an ideal choice for visible teeth. As a parent, you will enjoy our gentle and educational approach to dental care with our young patients. We will always make sure every question that you have is answered before beginning your child’s personalized treatment plan. We will also make sure that he or she will leave with easy-to-follow instructions on how to keep a bright, white smile. Learn more about our pediatric dentistry.